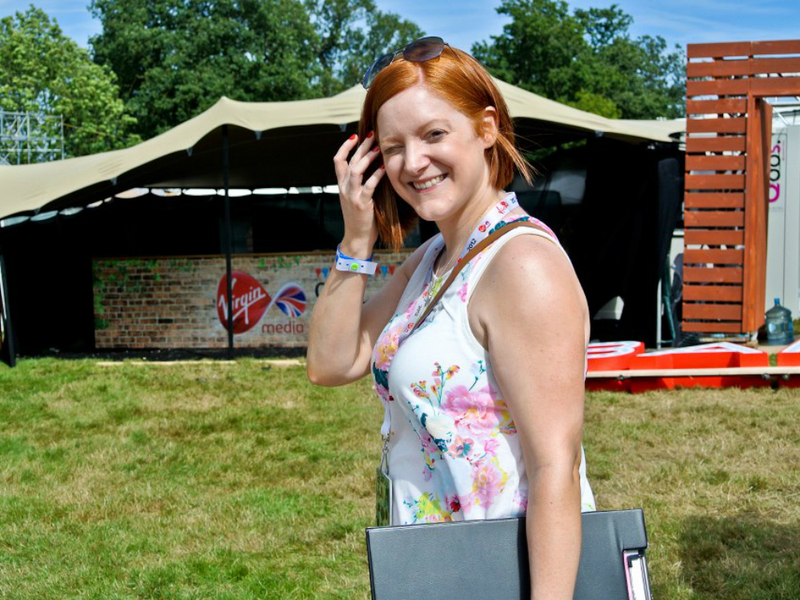 Verity Henderson, 36, is the Senior PR and Events Manger for Virgin Media looking after campaigns and events including V Festival and the Virgin Media Louder Lounge. After undertaking a Media Production degree at university, Verity found a work experience at a PR and Events company and was then offered a job helping to manage their high profile clients and VIP events. Jealous? Us? Keeping your energy levels up across the very long weekend at V Festival and getting through 20-hour days. Also sometimes being so busy that you don’t get to see any bands playing. But whilst it’s super hard work, I know how lucky I am to be able to do this job. What advice would you give to anybody else starting out in this field? Be prepared to get stuck in and get your hands dirty – being proactive and offering to support others will stand you in good stead in the long run. I’ve been given two essential pieces of advice in my career that have stuck with me. Firstly ‘professionalism at all times’ – meaning it doesn’t matter whether you’re dealing with a CEO, A-list celeb or the Prime Minister, always be polite, in control and certainly not star-struck! Secondly, ‘the devil is in the detail’ – it’s the smallest touches and experiences that can make a difference to a PR story or event. How many festivals have you been to in your lifetime, and what is your best festival memory? To be completely honest, I wasn’t a festival person before I started this job and going to other festivals now feels a little like a busman’s holiday. I did take my husband Rik and our daughter to Camp Bestival a couple of years ago which was so much fun – dancing to Mark Owen, Billy Bragg and Mr Tumble all in one weekend was odd, but unforgettable! What’s your top festival survival tip? Be prepared for all types of weather – take wellies and sandals, a raincoat and sunnies, and if it looks like it might rain, invest in a proper waterproof coat. I can handle anything as long as I’ve got the right footwear! Also find ways to reduce the drain on your mobile phone battery during the weekend – switch off all your live apps, turn down the screen brightness, turn off Bluetooth and vibrate, and switch off non-essential notifications or push email. When mobile phone signals begin to struggle, get connected to the WiFi to stay in touch with your mates – Virgin Media offers free WiFi across the sites at V Festival, so that’s always handy! Can you describe your most surreal festival moment? Working onsite at V Festival is awesome and tiring all at the same time, and sometimes I can be so busy that I don’t get to make it out of the Virgin Media Louder Lounge to see one of the bands playing the festival. But last year my team organised a little treat for us – we found ourselves joining Nile Rodgers on the main stage to sing and dance along to the last part of his set. Looking out over the crowd from the V Stage was definitely a highlight! What is the ultimate festival rookie mistake? Taking and losing your favourite designer sunglasses – I’ve lost too many beloved RayBans to mention over the years! Just take a couple of cheaper pairs you won’t be that upset if you lose. Also, don’t forget to pack the essential festival items… sun cream (particularly if you’re pale like me), anti-bac hand gel, tissues, baby wipes, Berocca, paracetamol, wellies and a good raincoat. Leave your valuables, credit cards and gadgets (other than your phone) at home. What do you wear when you’re working on site? Working in the Virgin Media Louder Lounge often feels like a catwalk – our guests are often enviably stylish. Even after eight years of doing this job, the challenge of running around in a field whilst trying to look chic is still something I’m trying to achieve! A jersey playsuit or denim cut-off shorts with sporty gladiators are my festival outfit of choice. Not forgetting the sun cream and hat for when the sun shines on Essex, of course. V Festival is taking place 20 – 21 August in Hylands Park, Chelmsford and Weston Park, Staffordshire.